1910.106(d)(3)(ii)(a). 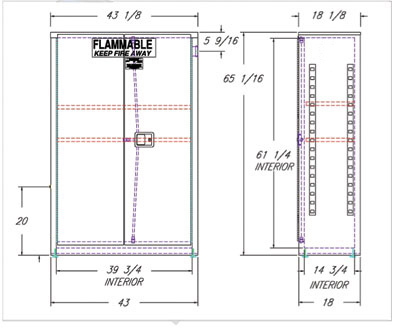 Metal cabinets constructed in the following manner shall be deemed to be in compliance. The bottom, top, door, and sides of cabinet shall be . . .double walled with 1 1/2 - inch air space. 6.3.3.2.a. The bottom, top, door, and sides of the cabinet . . . shall be double-walled, with 38 mm (1 ½ in.) air space.